Internet, Recently Renovated, New leather furniture, and TVs in Every Bedroom. This 3 bedroom villa, in building 54, is beautifully decorated. This unit is very close to the clubhouse and the door faces the walkway, rather than the parking lot. 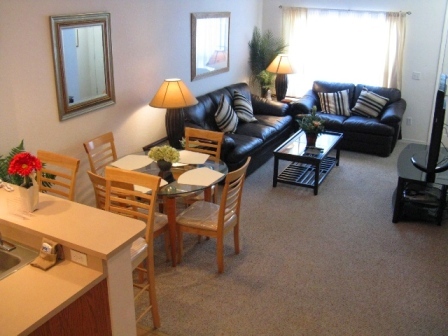 This unit has new living room furniture and a huge flatscreen! (new Feb 2011). With 3 bedrooms and 2 bathrooms, this fully air-conditioned, family friendly vacation home is perfect for families or for a few friends golfing or vacationing. 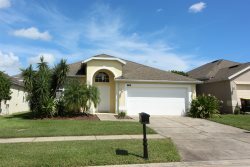 This Vacation Home has a spacious family room to relax in during the day or evening, cable TV, and DVD player to enjoy your favorite movie. Internet connection is available via an ethernet cable. The family room is open to the Dining room and the kitchen so that you can socialize while enjoying a great meal prepared in your own fully equipped kitchen. Spacious sleeping accommodation awaits you with 3 bright and roomy bedrooms. The main floor master bedroom has a king sized bed and a TV. It opens onto an attached ensuite bath with a big shower and a deep, jetted tub. Upstairs, both bedrooms have one double and twin bed. Each of the bedrooms has its own TV and they share a hall bath with tub and shower.